Becoming a well-rounded person involves exposing oneself to opportunities where we can learn more about ourselves and our communities. Clubs are a great way to help students broaden their worldview and find ways to excel and highlight their strengths. At Show Low, we offer both clubs of common interest and nationally recognized clubs. National Honor Society recognizes students who demonstrate excellence in academics, service, and citizenship. Members maintain a 3.5 (or higher) GPA, earn scholarships, and serve throughout our school and community. For additional information, contact Katelynn O’Connell. An academic competition for high schoolers to share knowledge and build communication skills while earning money for college. For more information, contact our advisor, Tonya Butler. Local chapters of Future Business Leaders of America brings business and education together through workshops, competitions, and project-based learning. Members develop leadership skills and skill certifications while in high school that can open the door for scholarship opportunities. For more information, contact our advisor, Missey Goodman. Family, Career, and Community Leaders of America is building the leaders of tomorrow by strengthening the families and communities of today. Our members explore careers, finance, community activism, goal setting, and healthy relationships. For additional information, contact Brandi Butler. Gender and Sexualities Alliance is a student-run club that provides a safe place for all students to socialize and develop a platform to fight gender and sexual inequality. Contact Carrie Houston for more information. Want to make a difference? Do you feel ill-equipped to stand up against bad decisions? Join Students Against Destructive Decisions, and be empowered! Big Brothers Big Sisters, is a community-based mentoring program. BIGS develop positive relationships with young people to encourage them to dream about their future and set goals to reach those dreams. We’re ensuring America has a skilled workforce through employability training, skill development, leadership, and citizenship. For more information, contact our advisor, Chuck Marchant. Art club is for open to all students who love art. We encourage all who want to improve their drawing, painting, and sculpting techniques to join us for our weekly meetings and portfolio building. Contact Jackie Johnson for more information. Join us for a time of studying the Word and encouraging one another to “not just hear the Word, but do what it says” (James 1:22). Our advisor is Jeanette Chasan. Develop an appreciation for other cultures and histories. Join us weekly in Mr. Curtis’ room. We love running! We watch. We participate. We attend. And we want to invite you to join us. Contact Mike Hall for more information. Curious about our world? Join us for experiments, fun discussions, and current science, technology, engineering, and math news in our after-school club. Our advisor is Erik Hanchett. Ski Club promotes active, healthy lifestyles by supporting students who are active skiers and snowboarders or those who would like to learn. We take ski trips throughout the season and enjoy being together in the great outdoors. For more information, please contact Nikki Muzzrall. Improve your language skills, and explore the culture of Spanish-speaking countries around the world in our interactive club. For more information, contact Mike Hall. 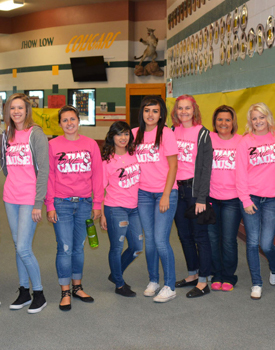 Student Council provides an opportunity for student empowerment and leadership. Our members are representatives voicing student concerns with school and community administration. They also serve and represent our school at public functions, raising funds to help other organizations. Our advisor is Derik Whipple. Teen Court provides an alternative measure for dealing with student discipline. In Teen Court, students are “judged” by a jury of their peers and sentenced with appropriate restitution options. Every role, except judge, within the court is filled by students, including clerk, bailiff, defense and prosecution attorneys, and jury members. Our advisor is Christa Rask. Calling all gamers and drone enthusiasts! Develop your skills, share tips, build friendships, and have fun in our club. Contact Jerry Butler for more information. Our indoor color guard group performs flag and dance routines set to music. Interested? Join us. Contact Kade MacNeille for more information. Visit these sites for more information about our clubs. Learn more about our local groups.